This blog connects to two earlier entries in medievalfragments: Irene O’Daly’s recent blog on how scribes are depicted in medieval art (here); and Jenneka Janzen’s assessment of how we are to understand the “physical scriptorium” (here). Something struck me when I read both pieces, in particular when I looked at the images accompanying Irene’s blog. The scribes in her story, as well as those in images I had on file myself, are depicted as individual copyists instead of scribes working in groups. Even when multiple scribes are presented in each other’s vicinity, such as the four evangelists in the Aachen Gospels of c. 820 (Fig. 1), we are still looking at multiple individual scribes – after all, they have their backs turned to each other and are separated by rock formations. My point, you ask? Where are the scriptoria, I reply! Fig. 1. Aachen Gospels (Aachen, Cathedral, s.n. c. 820). While the monastic scriptorium is the location where manuscripts were made – at least until c. 1200, when commercial scribes took over the monks’ role as primary book producers – it turns out that medieval images of scriptoria are rare. Very rare. Check this out: while a Google search consisting of the words “medieval” “scribe ” and “manuscript” returns dozens of writing monks, not a single one is shown in a spacey room working side by side with fellow monks – with the exception of images from the nineteenth or twentieth century. Even an intense search through various databases left me nearly empty handed. Here is what I did find. Fig. 2. Lay person and monk jointly making books in a Echternach Abbey (Bremen, Universitätsbibliothek, MS 217, c. 1020). This first image of multiple book producers at work in a monastic environment is from a richly-decorated Gospel Book produced in Echternach, Luxemburg (Fig. 2). It was made as a mighty gift for Emperor Henry II. The image shows a peculiar blend of two worlds: the individual on the right, a monk, is copying the text; while the person on the left, whose clothes show he is not a monk, produced the decoration. For important books such as this one professionals from the outside world were sometimes hired to decorate the pages. Is the place we see them working in a scriptorium? Perhaps. However, what the image really shows is how this particular book – the object sent to Henry II – came to be, namely with the help of a hired hand. Perhaps this image was added to show the receiver that a professional had decorated the object? (‘Spare no expense!’) In any case, it is unlikely that this illustration was included to show the inside of a scriptorium. This may be underscored by the observation that when lay scribes were asked to enter an abbey for the duration of a book project, they were usually separated from the local monks by order of the abbot. Fig. 3. 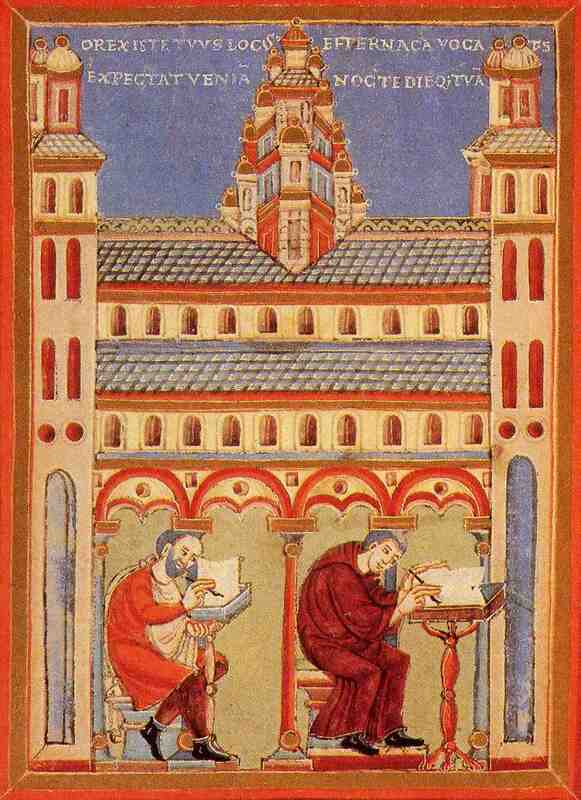 Scriptorium in tenth-century Spain (Madrid, Nat. Hist. Archaeological Museum, Cod., 1097 B, c. 970). The second image I found presents a similar scenario (Fig. 3). 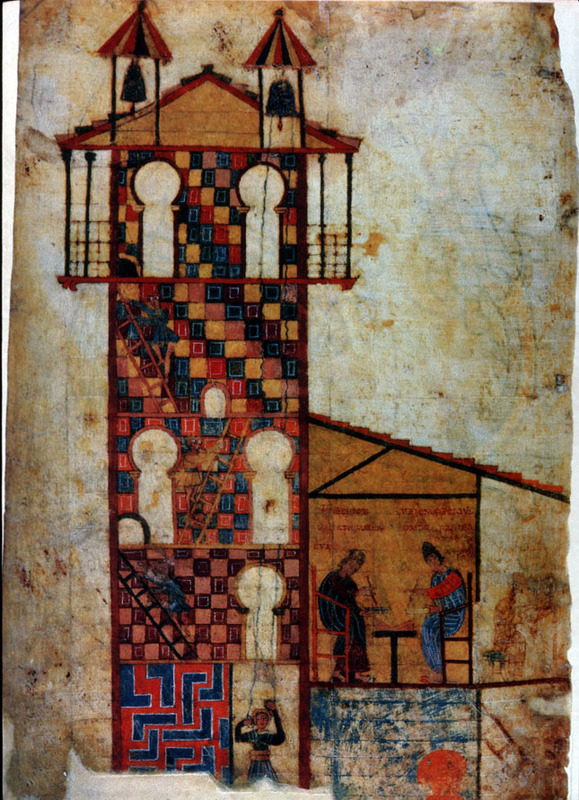 Shown is the scriptorium of Tábara de León, a monastery in Spain, in what is usually regarded as the oldest known depiction of a scriptorium (c. 970). The image is part of a copy of Beatus’ Commentary on the Apocalypse. The accompanying colophon identifies the monk on the left as “Senior”, while the individual across the table is “Emeterius”, who is dressed as a lay person. Both are working on a book (is Emeterius perhaps drawing images? ), while a third, in a room to the right, is cutting sheets (more information on this image here). While you are looking at a band of individuals producing a manuscript, the image likely shows how that very book was produced, as in Fig. 2. Both images presented so far raise questions rather than answer them. Are we looking at a realistic representation of a scriptorium? Or do they show how a particular book was produced; stressing, in particular, that the monks had help from an outsider? If these two images do show us the real deal, then the scriptorium is a tiny space, not a vast room with rows of desks. Or did the illustrator choose to sacrifice a realistic view of a spacious room in order to show multiple individuals in the small space of a miniature? Fig. 4. Paris, BnF, Lat. MS 818 (11th century). The third image I found, which is part of an eleventh century missal (Fig. 4), underscores the issues encountered so far. The two figures appear to be involved in the production of a book. The individual on the left is writing on a wax tablet with a stylus, while the other is perhaps ruling a parchment sheet with a sharp object. (Or is he cutting sheets?) What may appear to be the inside of a scriptorium, could, in fact, also be showing us something else. If we zoom out and observe the full page, we see that the two figures are placed in a cramped space underneath the main character, a saint, who is writing text on a wax tablet with a stylus. 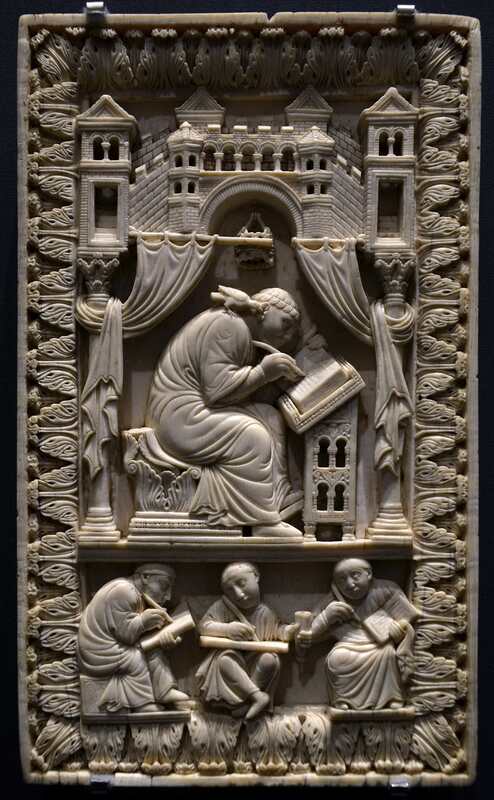 It reminds me of the famous tenth-century ivory cutting showing Gregory the Great towering over some ‘dwarf’ scribes copying his works (Fig. 5). Three scribes producing manuscripts in a confined space do not constitute a scriptorium. Or do they? Fig. 5. 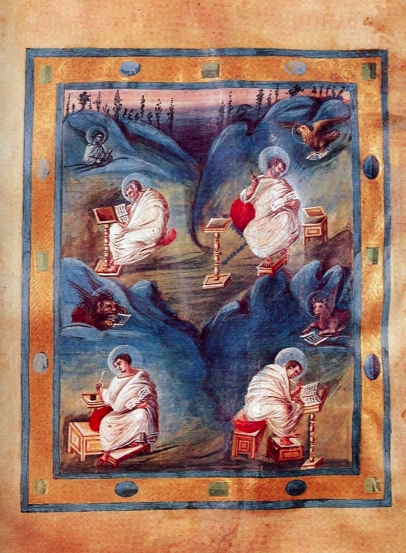 Gregory and his scribes (Vienna, Kunsthistorisches Museum, 10th century). Having searched the web far and wide, I came up with one last image. This scene is hard to trace back to a specific manuscript, but it appears to be kept in Madrid’s Bibliotheca de San Lorenzo de El Escorial – this is where I found it (Fig. 6). At long last, I hear you say, a real scriptorium, fitted with benches that are filled with scribes copying books, while a scriptorium master is looking on. Fig. 6. Spanish scriptorium? (Madrid, Biblioteca de San Lorenzo de El Escorial, 14th century). Perhaps this is so, but there are issues here, too. For one thing, the scribe in the back is not a monk but a lay person. A rich one by the looks of his clothes and hair. The figure in the middle appears to be a monk, but the person on the right is likely not. The image comes close to what we would imagine a scriptorium to look like, judging from such descriptions as “[in the cloister] you might have seen a dozen young monks sitting on chairs in perfect silence, writing at tables carefully and skillfully constructed” (quote taken from Jenneka’s blog, mentioned earlier). However, the lay person in the back would seem out of place, as does perhaps the individual on the right. In spite of all the obscurity in this blog, my main point stands: where are the scriptoria? After all, a search on the web and in my bookcase did not produce more than a handful of scenes where we see multiple individuals working on books in the same physical space. That none of them convincingly show us the inside of a monastic scriptorium does not matter. The biggest mystery, in my opinion, is why there are so few depictions of multiple scribes working together.